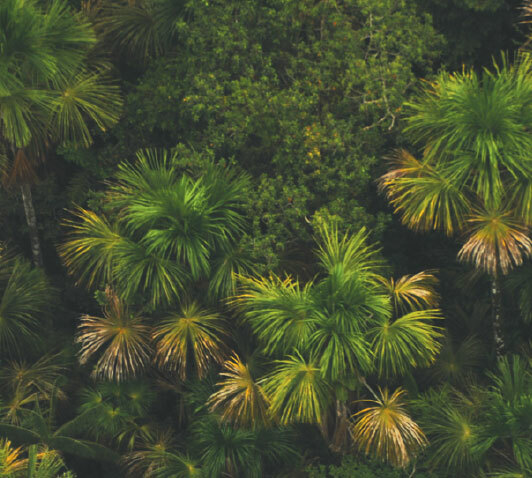 The Amazon region is characterized for its large areas of rainforest, where trees such as ceibo, sande, and caoba can easily grow and reach a height of 50 meters. Nevertheless, there are areas where water replaces firm ground, rivers suddenly become narrow canals, medium and large lagoons appear, and canoes are the only way to get around in between the trees and vegetation. These are the flooded Amazon forests, which are protected in its majority within this great reserve. This protected area is named after the Cuyabeno River, which overflows in its midpoint creating a 14 lagoon complex and also the most extensive wetlands of the Ecuadorian Amazon. These flooded forests are the territory of dolphins, manatees, alligators, anacondas, otters, and of the water guarango tree, the most unique tree in this reserve; thanks to its special adaptations, it can grow on the shores of rivers and lagoons, creating a magic and mysterious environment that attract thousands of visitors every year. The reserve is also considered one of the most culturally diverse protected areas in the Ecuadorian Amazon. The indigenous communities of Siona, Secoya, Cofan, Kichwa, and shuar live in this area. You must arrive to the city of Lago Agrio by land (270 km of paved road) or by air (35 minutes). Cuyabeno Bridge. Take the road Lago Agrio-Tarapoa-Puerto El Carmen de Putumayo until you reach the bridge over the Cuyabeno River (100 km) here you´ll find the control checkpoint to enter the reserve. From the bridge you navigate through the river until you reach Laguna Grande. The river path takes about one hour and forty minutes, depending on the river´s water level. Through the Aguarico River. Take the road to Puerto Mercedes, from where you navigate on the Aguarico River. Along the river there are several indigenous communities. Km. 76 road Lago Agrio-Puerto El Carmen de Putumayo. The reserve is found in the north area of the Ecuadorian Amazon and includes water basins of three important rivers: Cuyabeno towards the northwest, Lagartococha to the east (this is also the bordering limit with Peru), and Aguarico that runs through the Fauna Production Reserve Cuyabeno from west to east. 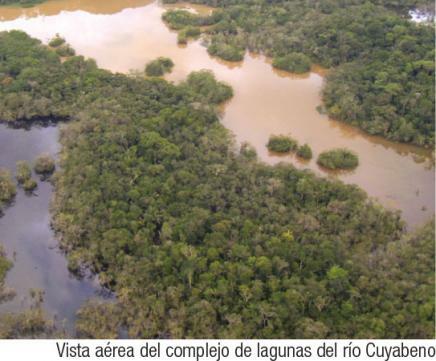 Even though the firm land tropical rain forest is the most abundant ecosystem in the reserve (and of the Amazon in general), the flooded ecosystems adjacent to the Cuyabeno and Lagartochocha rivers are what distinguisha this protected area from other areas of the eastern region. In order to get to know a little more about the geography of the reserve and to understand the dynamics of these forests it is necessary to familiarize onself with the two types of rivers that exist in the Amazon and that are also present in this reserve: white-water and dark-water rivers. White-water rivers originate on the mountain range, and when they descend the haul along many sediments that give the water a tan-yellow color, such as the Aguarico. The areas that are temporarily flooded by these waters are called varzeas and are sediment-rich, which is why they are preferred for agriculture. On the other hand, dark-water rivers originate within the jungle and their color is dark due to the presence of decomposing vegetal material that fall in its waters, such as the Cuyabeno and Lagartococha rivers. The areas flooded by these rivers are known as igapos, and can remain flooded for several months of the year. Cuyabeno and Laguna Grande area. Surrounding the lake system and the Cuyabeno River there are several camps where you can stay. Palma Roja. This is a 1.6 km trail that runs through the non-flooded tropical forest and part of the flooded forest, characteristic of the reserve. Medium difficulty. El Saladero. This is a 1.7 km long trail that runs through the lagoons and non-flooded forest. It ends in a salting or quagmire where you can observe an infinity of macaws, parrots, and several mammals. Medium difficulty. Copal. This is a 2.5 km long trail that runs through the lake system, the rivers, and the flooded and non-flooded tropical rain forests. Medium difficulty. 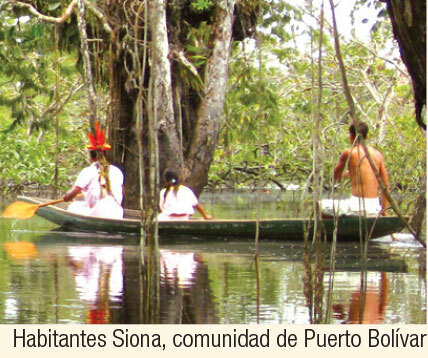 The siona indigenous community of Puerto Bolivar, on the Cuyabeno riverside, the cofan community of Sabalo, on the Aguarico riverside, and the kichwa community of Zancudo, on the Zancudococha lakeshore, have community tourism activities. 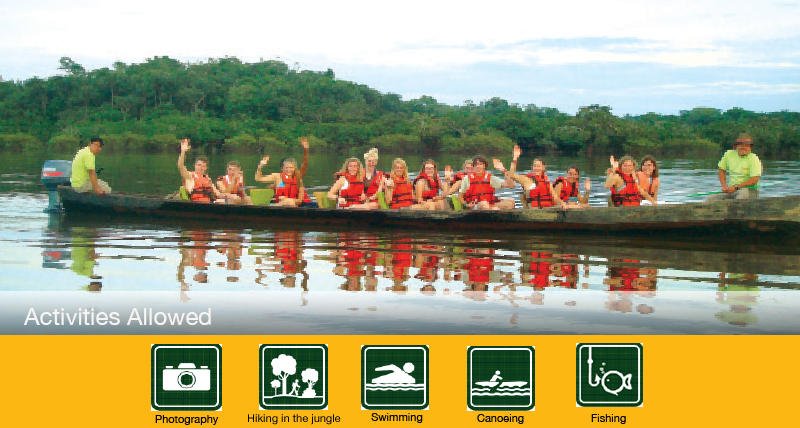 You can explore the tropical rainforest, go canoeing on the rivers and buy exquisite artisan crafts. The territory that makes up the reserve today has been home to huma settlement for a very long time. Formerly the basin of the Aguarico River was inhabited by the 'encabellados'. The Spaniard chroniclers called them this because of the long and much adorned tresses of these people. The sionas and the secoyas that live within the reserve today are descendants of the “encabellados” whom lived in different areas. The sionas lived more towards the north, in the area between the Aguarico and Putumayo rivers, on the border between Ecuador and Colombia. The secoyas, on the other hand, inhabited the riverbanks of the Napo on the Peruvian side; they migrated to the riverbanks of Aguarico River in 1940 pressured by the rubber industry. The cofanes occupied, and still do today, the high basins of the rivers Aguarico and San Miguel. The current inhabitants of the Cofan de Sabalo community navigated downstream in 1972 and settled in the central area of the reserve. There are also Kichwa communities, especially along the Aguarico River, in the area known as Playas de Cuyabeno- in its encounter with Aguarico- and in the Zancudo area, on the east side of the reserve. The firm ground forest that covers the majority of the reserve is very bio-diverse; nevertheless, here we´ll only refer to the aquatic environment´s flora and fauna, which are the ones that charachterize Cuyabeno. The water guarango, the most representative of the area, grows in canals and edges of the lagoons flooded by dark waters (igapos). 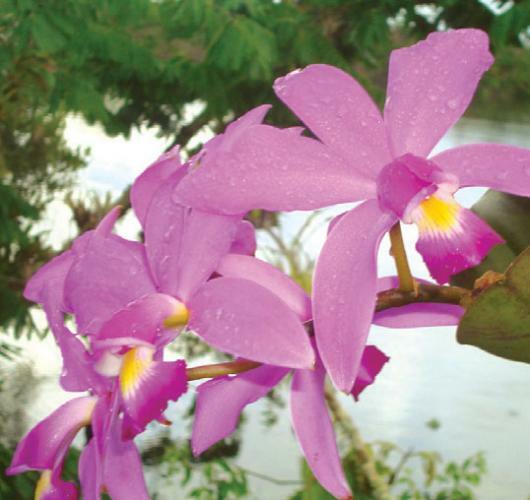 This is the most visited area of the reserve to which you enter navigating along the Cuyabeno River. The Laguna Grande, as its name indicates, is the largest of the 14 that exist in this area. From here, through small canals, you can visit other lagoons such as Caimancocha, Mateococha, or Canangueno. On its surroundings there are several trails that go into the forest. The most visited are Palma Roja, Saladero de dantas, and Quebrada la Hormiga. The Lagartococha River marks the border with Peru and it also is the eastern limit of the reserve. You´ll have an unforgettable experience navigating through this river and its small canals, not only because of the flooded jungle scenery, but also because of the wild flora and fauna variety that you will find, especially birds and monkeys. Here you can navigate several lagoons, especially Imuya, Redondococha, and Delfincocha. 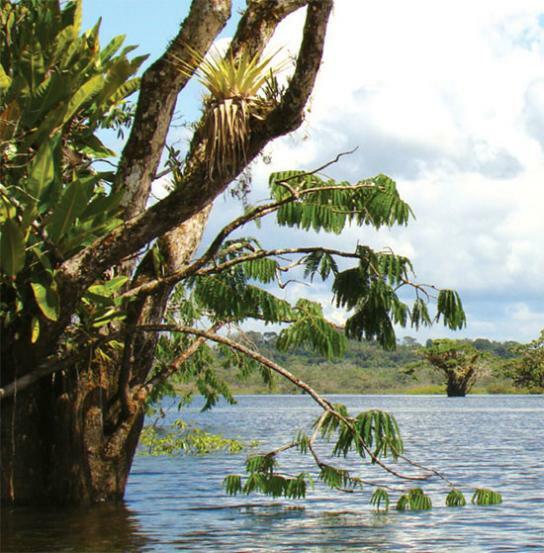 The largest lagoon of the Ecuadorian Amazon is found in the lowest part of the reserve, next to the Aguarico River. Its name is amazing, it comes from the sianosecoya soncari word, that means “sonco´s lagoon” referring to a small fish that is abundant here. Close to the lagoon is the Kichwa de Zancudo community that maintain a community tourism program. On the surroundings of the indigenous communities of Siona de Puerto Bolivar, on the Aguarico riverside, and the Cofan de Sabalo community, you can travel through the tropical rain forest, go canoeing, and buy artisan crafts made with seeds and other products of the forest. Clothing. Light clothes and rubber boots for hiking around the area. Guides. 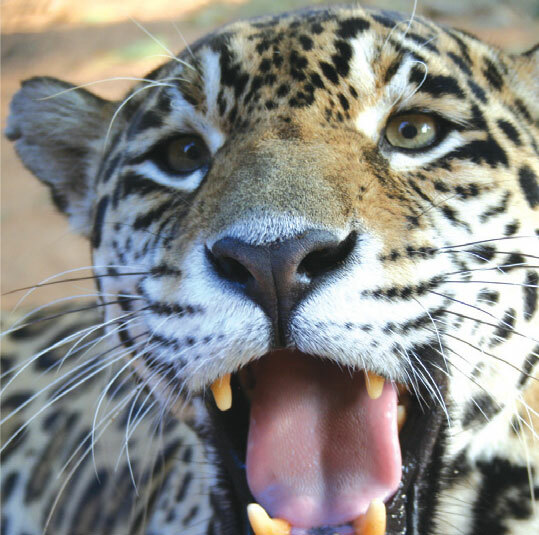 The entrance to the reserve must only be done with tourism operators that have been authorized by the reserve and that have certified naturalist tour guides.